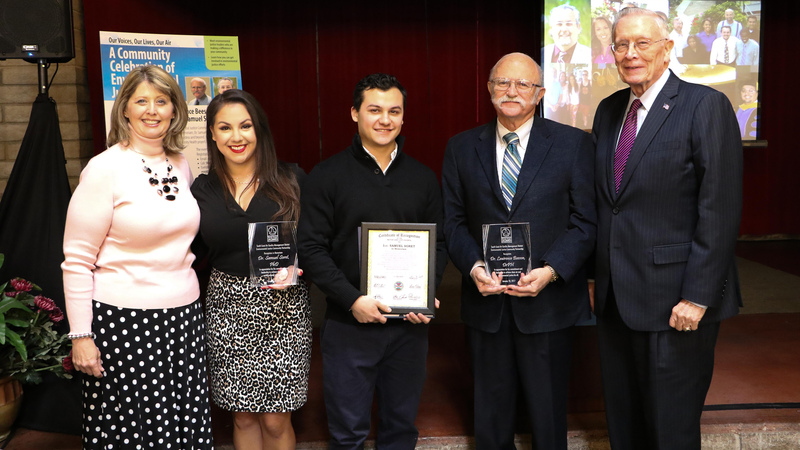 On January 18, 2017, the South Coast Air Quality Management District (SCAQMD) held a ceremony that honored two faculty from the Loma Linda University School of Public Health; Dr. Larry Beeson, DrPH, Epidemiologist and Dr. Sam Soret, PhD, Environmental Health Scientist. The SCAQMD is the air pollution control agency for all of Orange County and the urban portions of Los Angeles, Riverside and San Bernardino counties. Dr. Beeson attended the ceremony with his wife and said he felt honored to be receiving recognition for his work. Dr. Soret was also recognized posthumously for his contributions to air quality improvement. His daughter, Carmen and son, Adam, accepted the honors on his behalf. Both Dr. Beeson and Dr. Soret were recognized for their research and interventions related to air quality within San Bernardino county. Both had been a part of the Environmental Railyard Research Impacting Community Health (ENRRICH) Project, or sometimes referred to as the Railyard study. “It’s a team effort. We’re a very productive air pollution research team that includes David Shavlik, Synnove Knutsen, Susanne Montgomery, John Morgan, Rhonda Spencer Hwang, Penny Newman, Director for the Center for Community Action and Environmental Justice, of course Sam Soret and many more. I’m just a part of the team that’s responsible for taking research and bringing it to the community level rather than just leaving the research published in a scientific journal.” Dr. Beeson said. The ceremony was held just a few blocks South of where the Railyard study took place, in the Mitla Café on route 66 in the city of San Bernardino.